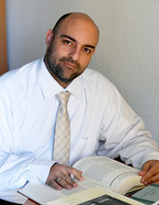 Marios Argyrides is an Assistant Professor in the Department of Psychology at Neapolis University and a Licensed Psychologist in Cyprus. He received a PhD in 2006 in Counseling Psychology from Tennessee State University and an MSc in 2002 in Applied Clinical Psychology from the University of South Alabama. He has worked as an intern at different counseling centers of universities including the University of South Alabama, Tennessee State University and Vanderbilt University. He completed his Pre-Doctoral Internship at Florida State University. He has worked as an instructor at Tennessee State University and as a visiting lecturer at public and private universities in Cyprus. He has also served as the Head of the Counseling Center at the University of Cyprus. He is an Associate Scientist in several research teams and has published several articles and specialized books whilst also presenting at international conferences. He is a professional member of the Cyprus Psychological Association and the American Psychological Association. He is also the Associate Editor of the European Journal of Counseling Psychology.